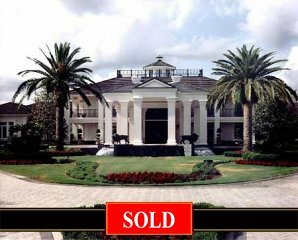 The most outstanding property offered in Orlando! Located in world famous golf community, on 3.7 Acres, nestled 1700' of shoreline on the famed Butler Chain of Lakes with stunning views from nearly every room. This striking residence offers large rooms , designed for a variety of uses, formal and informal Living areas, a large Family Kitchen, lakefront Garden Room and a 2200 Sq. Ft. Master Bedroom Suite, with doors leading to the Rose garden. A 3-bedroom adjoining apartment offers comfortable space for family and friends. In addition to this, there is also a 2-bedroom, 2-bath Guest cottage with private Terrace. Other highlights include a screened gazebo, boat dock, fully equipped cabana with Summer Kitchen, changing rooms and baths. A widow's walk on the Main House offers a 360-degree panoramic view of the lakes, Cape Kennedy launches and the Disney fireworks. Partially furnished.